CLEVELAND (AP) — Ol’ man Rivers keeps rolling along. San Diego did most of its damage on the ground with Gordon running for 132 yards and scoring on runs of 4, 10 and 11 yards. The Chargers had 246 yards rushing. Rivers and Williams connected on scoring plays of 45 and 29 yards in the first half, and Gordon’s 11-yard run put the Chargers up 35-6. Mayfield’s third start as a pro was a rough one. The No. 1 overall pick was sacked five times, tweaked his ankle when he slid on a sideline marker and threw two interceptions. The Browns (2-3-1) were blown out after playing five tight games — three going to overtime — and showed there’s still a long road ahead. While young QBs like Mayfield, Carson Wentz and Patrick Mahomes may be the NFL’s next wave, Rivers is showing that the old guys can still get the job done. He has thrown 15 TD passes with just three interceptions, and he did all he could to block Browns linebacker Jamie Collins to help Keenan Allen pick up a first down despite the Chargers leading 28-6. Los Angeles caught a break on Rivers’ second TD pass to Williams. Williams’ first TD catch was more spectacular. 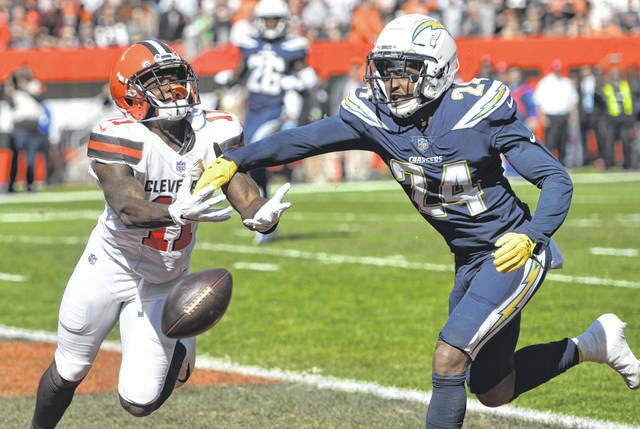 Leaping with three Browns defenders around him, he wrestled the ball way from Browns safety Damarious Randall to give the Chargers a 14-3 lead. Mayfield was under duress from the start, and he didn’t get much help from his wide receivers. Rookies Antonio Callaway and Damion Ratley both missed potential TD catches in the first half. While running out of bounds on a scramble in the first quarter, Mayfield skidded on the plastic marker on L.A.s’ sideline and he favored his leg throughout the rest of the game. The Chargers’ kicking woes did not come into play. Sturgis, who has been dealing with a quadriceps injury, missed a field goal and PAT last week. He also missed two extra points in L.A.’s previous game. The Browns honored future Hall of Fame tackle Joe Thomas by adding 10,363 — the number of consecutive snaps he played over 11 seasons — to the club’s ring of honor. Thomas retired following last season, which came to a premature end for him when he tore his triceps. He grudgingly retired in March. Browns: LB Joe Schobert (hamstring) left in the third quarter, and LB James Burgess (hamstring) went out in the fourth. … WR Rod Streater suffered a neck “stinger” while covering a punt in the first quarter and did not return. Streater’s injury complicated Cleveland’s issues at wide receiver as Rashard Higgins and Derrick Willies were also out with injuries. The team signed free agent Breshad Perriman on Saturday, but he wasn’t active.